"I love you, but not the way you think." Breathless has been called the most important movie since Citizen Kane, and, like Orson Welles' debut, Jean-Luc Godard's is full to bursting with ideas and that potentially damning word, potential, not just for the director, but for the wave he led. As my esteemed editor debi lee mandel aptly describes it in her review of a previous DVD release of the title, the plot of the film is almost laughably slim—and yet what's here really is no less than a cinematic revolution. Godard's style is almost throwaway—what's so profoundly galvanizing is the director's technical achievement, married to a tale that's very self-conscious of its movie lineage, but still has both respect and empathy for its characters without descending into cheap and sneering postmodernism. The director's principal breakthrough is his puncturing of the carefully maintained illusion of movie scenes playing out in real time and space, a conceit fostered by a couple of generations of studio filmmakers on either side of the Atlantic—but Godard isn't merely some cinematic terrorist interested in blowing things up. Rather, the movie is shot through with an almost Humpty Dumpty quality, if you will—and Godard is able to put it all back together again in a way that makes us see something that could be shopworn as new and refreshed. Jean-Paul Belmondo stars as Michel, a petty thief who has unwisely offed a cop, and there's just enough tension in this story to sustain suspense for the running time of the movie, and to give us a nauseous understanding very early on of how this all must end—he's on the lam, even if he's too easily distracted by pretty girls and pretty cars. He's both a natural tough guy and a careful student of cinematic representations of the specimen—Godard has him stare down a publicity photo of Humphrey Bogart at one point, for instance, and you can practically feel Michel going to school on Bogie. And if there's a tough guy, there's got to be a gun moll—here it's the luminous Jean Seberg, whose smile will melt you and makes you understand in an instant why Michel is so loopy for her. They may try a little too hard to be cool, but in truth cool comes to them almost effortlessly—they're enchanting together, deeply hypnotic and profoundly connected. Out of this one movie comes almost all of the nouvelle vague—François Truffaut was Godard's writing partner on the screenplay; Jean-Pierre Melville has a wonderfully fatuous cameo as a famous writer holding a press conference, trying both to come off as a grand man of letters and to hit on Seberg; and the indispensable Raoul Coutard was the film's cinematographer, establishing the signature, almost throwaway look of Godard's early work. In many of the Parisian street scenes, pedestrians gawk at the camera—it may be because of the novelty of seeing a film crew out and about, or the magnetic, undeniable star presences of both Seberg and Belmondo, or all of the above. You could fault the film some for some of the lazy French and American stereotypes that the leading man and lady toss around—but why you would want to spend your time finding fault with Breathless, I cannot imagine. Image Transfer Review: Coutard's work looks really quite spectacular here—the guerrilla quality of the filmmaking is preserved, but you also appreciate the careful framing and the visual storytelling. Any discolorations or scratches seem to be evidence of wear on the source material, not because of the transfer. Audio Transfer Review: No quarrels with the audio either, even if all the location shooting and the mono track mean that there are necessary limitations. Extras Review: Unlike the previous DVD release of this title, this Criterion two-disc set doesn't sport a commentary, though without one it still brings an enormous amount of illumination and context. 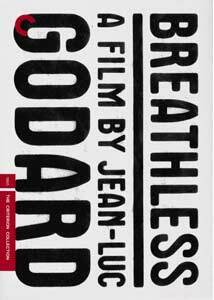 The feature is on Disc One, along with an original trailer and a package (27m:00s) of five interview excerpts from French television from the early 1960s: two with Godard (including one discussing the film's reception at Cannes), and one each with Belmondo, Seberg (showing her emotional scar tissue from Otto Preminger) and Melville (the merry eminence grise of the nouvelle vague). Disc Two begins with twin reminiscences (22m:27s) from Coutard and assistant director Pierre Rissient—they're shot separately, discussing the production, and the birth of Godard as a filmmaker. Documentarian D.A. Pennebaker discusses (10m:32s) working with Godard on later projects, and the documentary influence on Breathless—Robert Drew's Primary is a particularly vital source. A video essay (18m:56s) on Seberg by Mark Rappaport is part biography and part mash note; another such essay, by Jonathan Rosenbaum, called Breathless as Criticism (11m:08s), emphasizes the director's contributions to Cahiers du cinèma. And the faintly obsessive quality to this set is in full bore with Chambre 12, Hôtel de Suède (01h:18m:27s), a 1993 French television production that's a slightly creepy bit of cinematic stalking. Host Claude Ventura is on a nine-day quest to learn as much as possible about the production of the film, and his mission has a particular urgency, as he's shooting in the days before one of the film's principal locations, Seberg's hotel, is to be torn down—he starts with a cryptic letter from Godard, and tracks down Belmondo and Coutard, among others. Godard made a series of shorts before his first feature, and one of them, Charlotte et son Jules (12m:41s), from 1959, is also included—it stars Belmondo, and show flair and promise, if not yet all of the control and freedom of Breathless. Finally, an ample accompanying booklet includes an essay on the film by Dudley Andrew; excerpts from interviews with Godard; and a couple of drafts of the treatment for the screenplay, giving us a chance to assess what can be ascribed to the director, and what to Truffaut. All in, it's a tidal wave of information, all of it worthwhile. Can this movie really be almost fifty years old? It still blisters with the energy of possibility and revolution, and remains hypnotically enchanting, as smashing a directorial debut as there ever has been. Criterion's two-disc special edition is a stunner, and is most highly recommended.